Salc > International Criminal Justice	ICC Withdrawals: Is Africa Running Away from Justice? 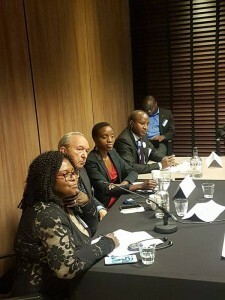 SALC and The Hague based Africa Legal Aid (AFLA) hosted a side event entitled, “ICC Withdrawals: Is Africa Running Away from Justice?” on the margins of the 2016 International Criminal Court Assembly of States Parties (ASP) on 18 November 2016. In October 2016 South Africa and Burundi wrote to the United Nations Secretary General announcing their intention to withdraw from the Rome Statute of the International Criminal Court. They were later followed by Gambia. These unfortunate developments triggered questions about an African mass withdrawal from the ICC and raised great concern about the future of international criminal justice in Africa. To shed light on these developments SALC and AFLA filled a venue with active participants who were eager to hear perspectives from civil society organisations on the ground. The event began with a keynote address from Justice Richard Goldstone who reflected on the developments and shared his thoughts on the future of international criminal justice in Africa. Justice Goldstone noted with concern the unfortunate notice of withdrawal by South Africa. He expressed his confidence that it will be the topic of rigorous debate in South Africa. Whilst he paid due regard to the imperfections of the ICC he encouraged constructive engagement with the ICC as the only permanent international accountability mechanism. He spoke of the need to remember the victims of egregious crimes and to prioritise justice and accountability. He was followed by SALC’s Angela Mudukuti who discussed South Africa’s withdrawal including ongoing litigation challenging the constitutionality of withdrawal. SALC is involved in litigation challenging the constitutionality of the notice of withdrawal, a matter that was heard in the North Gauteng High Court on 5 and 6 December 2016. Lambert Nigarura, from the Burundi National Coalition for the International Criminal Court followed, discussing the tense situation in Burundi and ongoing perpetration of international crimes. He highlighted the plight of victims and the fact that civil society organisations and human rights activists face serious reprisals from government. He also pointed out that a vast majority of the victims welcome the ICC’s intervention. Mr Nigarura, expressed the need for justice and accountability in Burundi and his hope that calm would be restored in Burundi. The event was chaired by AFLA’s Evelyn Ankumah, who shared her reflections on the importance of critical engagement on the issues raised by African states and the fact that the fight against impunity must be prioritised. The event was informative and was well attended.